I’m just reading Lisa Appignanesi’s so-far excellent book Mad, Bad and Sad: A History of Women and Mind Doctors from 1800 to the Present where she reproduces an 1810 table of causes of insanity from London’s Bethlem Hospital on p54. It was compiled by the physician William Black and lists various afflictions that have apparently caused mental illness followed by a count of the number of affected patients. There’s an interesting short research report in Cortex about how a national symbol adopted in Italy after the 1980 terrorist bombing of Bologna train station likely instilled a false memory about the following 16 years. On the morning of August 2nd, 1980, at 10.25, a bomb exploded in Bologna Centrale station, killing eighty-five people wounding over 200. 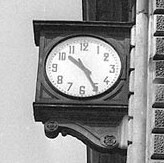 The blast also stopped the large station clock on the side of the building at the moment of the explosion, freezing the hands in the 10.25 position. Shortly afterwards, the clock was repaired and it continued to function normally for 16 years. However, when it broke in 1996, it was decided to leave the clock in its broken state and permanently set the hands at 10.25 in remembrance of the tragedy, owing to the fact that the image of the frozen clock had been widely used in commemorations during the intervening years. A group of Italian psychologist were aware that repetition tends to cause false memories and decided to test residents of Bologna, all familiar with the station, for their memory of the clock. What they found was that the majority of people falsely remembered that the clock had been frozen since the bombing and never worked since, despite the fact that this was never the case. This included those who had regularly seen the clock working fine, presumably on a daily basis, owing to the fact that they worked at the station during the 16 intervening years. Of the 173 participants who knew that the clock is now stopped, 160 (92%) stated that the clock has always been broken. 127 (79%) further claimed to have seen it always set at 10.25, including all 21 railway employees. Most interviewees did not know that the clock had been working for over 16 years and stated that it had always been broken. From the 173 people who knew that at the time of testing the clock was stopped, a subgroup of 56 citizens who regularly take part in the annual official commemoration of the event has been further considered: only six (11%) of them correctly remember that the clock had been working in the past. The findings are an interesting parallel to a study published last year on the London bombings. The researchers asked participants about their memories of seeing TV footage of the bus exploding in Tavistock Square. Despite the fact that no such footage exists and no reconstruction was ever shown on TV, 40% of British participants ‘remembered’ seeing it and produce ‘details’ of the coverage when asked. Link to study on Bologna bombings. Link to summary of London bombings study. Advances in the History of Psychology has just alerted me to a fascinating short article on the work of the influential 18th-century physician Samuel Tissot, who wrote a book arguing that concentrating on books for too long damaged the mind. The 18th century was when books were becoming cheap enough to be widely available to the middle classes and it’s interesting that this new cultural development produced a similar pseudo-medical concern about damage to the mind that we often hear today, but in a completely different direction. While modern day technological doom-sayers suggest that technology damages the mind because it interrupts concentration, 18th century technological doom-sayers suggested that reading damaged the mind because it required too much concentration. Neither have an evidence base, but I maintain a morbid interest in medicalised concerns about new technology and cultural innovations, which often take the same basic form but cite a cause which is always curiously in line with the authors’ prejudices. It turns out Tissot, like many of this medical contemporaries, was also obsessed with masturbation, which he cited as the cause of madness and a host of other psychological problems. Catholic church aside, it seems a ridiculous view to us now, but it was widely held by some of the most prominent and influential medical men of the time. Link to Guardian ‘Beware: studying can make you ill’. Link to AHP on ‘Read Till You‚Äôre Crazy’. The new edition of Scientific American Mind is out an it has an excellent cover article on the psychological effects of humour and laughter. It’s a remarkably wide-ranging article, covering everything from the effect on the immune system, to laughter’s pain killing properties to its beneficial effect on mental health. In 2006 psychologists Eric R. Bressler of Westfield State College and Sigal Balshine of McMaster University in Ontario reported that women are more likely to consider a man in a photograph a desirable relationship partner if the picture is accompanied by a funny quote attributed to the man. In fact, the women preferred the funny men despite rating them, on average, less intelligent and less trustworthy. The issue also has freely available online articles on ‘brain training’, the psychological effect of architecture and personality disorder with many more in the print edition. Wired has an excellent article on the Allen Institute for Brain Science’s ambitious mission to map where each gene is expressed in the brain. We tend to think of genes in terms of their ability to pass on characteristics to new generations, but the moment the egg and the sperm combine, genes start coding for proteins which the body uses to do its work. Of course, this includes the brain, so knowing what type of genes produce proteins in which areas of the brain gives us a big clue to some of the brain’s functions. The article is, perhaps, a little overly hopeful about the significance of a having a gene map for understanding complex mind functions or disorders (autism is mentioned as an example) – suggesting that some research hits a dead end without it. Perhaps something useful to mention is that one of the key pieces in the puzzle of gene expression in the brain is not where genes are expressed but under what conditions they are expressed. While your DNA has the ability to express every protein it has genes for, the cell regulates this process so it reacts to current conditions dynamically. In other words, the genes are more of a reference book, and the cell’s other regulation processes decide how and when to use this information. As far as we know, all learning in the brain happens through proteins, meaning that experience, learning, thought, motivation – or any other ‘psychological level’ process we can think of, acts through the many, complex and not fully understood regulation processes. So understanding the reference book is an essential but insufficient part of the picture. The real deal is in understanding how the brain’s cellular workers use the information to mediate between genes and the processes we understand at the psychological, behavioural or experiential level. This is part of the new science of epigenetics, and there are high hopes that this will be a big part of future neurobiology. This doesn’t imply that we don’t need to understand the role of experience and the environment in deference to purely reductionist neurobiological models. In fact, these new developments have stressed the importance of integrating these bigger concepts. And this is largely because we now have the beginnings of a science that could help us make links between these different levels of explanation. Nevertheless, the Allen Brain Atlas is an important and exciting part of this new science and the Wired article is a great introduction to the project. Link to Wired article ‘Scientists Map the Brain, Gene by Gene’. Link to Wired image gallery of the Allen project. The New York Times has an obituary for Earl Wood, the man who invented the G-suit, the pressurised suit for fighter pilots that prevents them losing consciousness when g-forces drain blood from the brain. The problem became apparent as fighter plane technology advanced to the stage where they became so fast and manoeuvrable that pulling tight corners or sharply accelerating put huge strains on the pilots’ bodies. To counter a precipitous drop in blood pressure, the team designed a suit that placed air bladders at a pilot‚Äôs calves, thighs and abdomen; a valve inflated the bladders as G-forces increased. Constriction of the bladders on the arteries raised blood pressure and helped keep blood flowing to the brain. The suit‚Äôs prototype was tested successfully by Dr. Wood and others in a dive bomber on flights that involved steep descents. At the same time, the Mayo team developed an exercise, called the M1 maneuver, in which a pilot would shout or grunt under G-force conditions. The grunting compressed arteries and tensed muscles and was at least as important as the revolutionary suit for resisting G-forces. Link to obituary for Earl Wood, G-suit inventor. Bad Science has a great article on the ‘copycat suicide’ effect, where media reporting of suicide can increase the chances of suicide in other people. Copycat suicide is sometimes called the ‘Werther Effect’, after Goethe published his 1774 novel ‘The Sorrows of Young Werther’ which depicted Werther’s suicide and was reportedly followed by people imitating the same method to end their lives. It’s an interesting effect because it shows the influence on the media on what people usually think of the most extreme of decisions. An excellent 2003 review article on the subject found that the effect holds for all media reports of suicides (including fictional ones) but celebrity suicide is most associated with subsequent deaths. Interestingly, it notes that the largest known increase followed the death of Marilyn Monroe. The review also found found that the greater the coverage of the suicide, and the more details in the reporting, the larger the increase in subsequent deaths. Because of this, there are now media guidelines for reporting suicide, and the Bad Science article reports on a particularly bad example where the journalist reported exactly the sort of thing most associated with increased risk in a single story – virtually nothing except details of the suicide method. There is a literature which I think is extremely powerful, and yet unanimously ignored by mainstream media, and that is the follow-up data on what happens later in life to people who have felt so suicidal that they have made serious attempts on their own lives. In extremis Pajonk et al followed up a large number of people who they picked up in intensive care after very serious suicide attempts. Amongst those who survived, and did not have serious psychotic illnesses, six years later, the majority were happy and well, living productive family lives, and were ‚Äì we might reasonably interpolate – glad to be alive. Link to Bad Science article on media reporting of suicide. Link to review article on media and suicide (with open-access link).